We are Sofer On Site - Scribes, Educators and Master Storytellers! A father, son & son-in-law team, together with our dedicated staff — we have found that being a Sofer entails great responsibility. The spiritual work of writing and caring for Torah scrolls is everlasting and therefore, we have to answer to a Higher Authority. As our name suggests, we are always local and on-site, wherever a Torah is found. We pride ourselves in traveling and visiting congregations and their Torah’s. Sofer On Site is a One Stop Shop for everything to do with Torah and much more. You will be amazed with the many opportunities we have created around Torah to engage and uplift communities. From inspiring New Torah Projects to emotional Holocaust Torah repair presentations with an abundance of insightful educational programs. With modern and advanced marketing and fundraising tools we help all those who want to bring Torah to life. Ready for a Torah Journey? email or call us to find out how we can enhance your next Torah Journey! Rabbi Gedaliah Druin was born and raised in Brooklyn, New York, where he received his B.A. from The University of Oklahoma in psychology, sociology and philosophy. engaging approach, he is able to connect with all audiences. 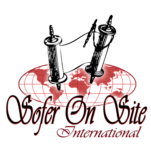 Today his company, Sofer On Site International, is distinguished as one of the world’s premier Torah Project developers, working with communities from Omaha to India on all facets of management, marketing, graphic artwork, fundraising and programming. Rabbi Moshe Druin lives in North Miami Beach, Florida with his wife and children. Rabbi Yochanan Salazar is a master sofer (scribe), educator and lecturer. Born in Ecuador, South America, he moved to the US as a teen. Before becoming a scribe he studied in Hudson College and later attended NJIT where he majored in electronics engineering and public speaking. While in college he met his wife Hanna, together they moved to Florida where they now live with their six children. He received his rabbinic ordination in 2004 from Rabbi Daniel Channen in Beit Shemesh, Israel. In Miami, Rabbi Salazar studied art of Safrut as an apprentice under Rabbi’s Druin at Sofer On Site . After years of training he received his ordination as a Sofer from Rabbi Eliyahu Ben Hayyim the Head of Sephardic studies at Yeshiva University in New York. With his expert and gifted talent for precise and accurate Torah repair work, he now heads the Torah Restoration Department of Sofer On Site . He often travels around the country restoring Torahs On Site, while educating communities on the proper techniques of Torah care. Rabbi Levi Selwyn was born in London, England where he attended the local Jewish school. He then continued his studies at the Yeshivah Gedolah in Hampstead. At the age of 18 he studied abroad at the Rabbinical College of America in New Jersey. As part of his rabbinical training, he traveled and worked with communities in France and San Francisco to teach and assist with inspiring educational programs. In 1999, he left to “down under”, Sydney Australia. It was there that he attained his Rabbinical ordination. In 2000, he became the Chief Rabbi of the Newtown Synagogue in Sydney. Rabbi Selwyn returned to the USA with his wife and daughter to Long Beach, CA - to serve as Director of the Hebrew School & Youth Programing for the Shul by the Shore. Rabbi Selwyn has now joined Sofer On Site in 2011 to serve as the Educational Director of many of the outreach and educational program activities. Rabbi Selwyn is a master teacher, educator and very passionate about motivating students. Together with his wonderful sense of humor, he is a well sought after guest speaker and presenter. Rabbi Yaakov Landau was born in Israel in 1971 to a Chabad Chassidic family. His schooling included Talmud Torah in Bnei Brak and yeshivot in Lod and Safed. He also came to the US and studied at the Lubavitch headquarters in Crown Heights under the supervision of the Lubavitcher Rebbe. At the young age of seventeen, Yaakov was ordained as a Sofer from Mishmeret STa’M in Bnei Brak, Israel. After completing his studies, he served his mandatory term in the IDF’s Military Rabbinate Corps, caring the spiritual welfare of his fellow soldiers. Since then, he has written two Torah scrolls and many tefillin and mezuzot. In 2013, Rabbi Landau, his wife and four children moved to South Florida and has been sharing his knowledge, skills and expertise with us here at Sofer On Site . He was the science curator and supervisor of education at the Brooklyn Children's Museum. He received his M.A. from The University of Oklahoma in philosophy - the spiritual and ethical development of mankind and completed his philosophy coursework and dissertation research for his Ph.D. He also taught Philosophy at the Santa Rosa College in California. In Israel, he managed a farm and later spent seven years learning in various Yeshivot and Kollels. He has been a teacher of Judaism, Israel and Ashkenazi and Sephardic traditions in diverse institutions at the elementary, high school and university level. He worked with youth movements and summer camps providing focused informal Jewish education. He returned to the USA to care for aging parents and studied and qualified as a Sofer STa"M. Today, Rabbi Druin travels the world as a master scribe restoring scrolls back to their original glory, and lecturing on the wisdom and wonders of the Torah, its making and letters. He inspires audiences of all ages with his unique and clear way of transforming ancient traditions into lively and exciting relevant lessons. Leah Yehudah was born in Singapore and raised in Sydney Australia. She is worldly educated and after a short stay in Israel during the Yom Kippur war, she went back to the land down under - Australia. She is a loving mother of 3 wonderful children. As a Ba’alos Teshuva (a “returnee to observant Judaism”), she respects and appreciates Jews from all walks of life. She worked as a legal secretary for one of the largest law firms in Century City, California. After moving to Florida, she did challenging volunteer work with special needs individuals in various hospitals & settings. Leah is an incredibly sweet and good natured person and as a newly welcomed member of Sofer On Site , she serves as a networking assistant, reaching out to congregations internationally. She inspires our team with her warmth and pleasant disposition and has endeared herself to our staff and colleagues here. Riki Druin was born in Johannesburg, South Africa and raised in North Miami Beach, Florida. Her practical and organized nature manifests itself in that she is able to break down large tasks and work efficiently on any project. She is open minded, can think out of the box, and can even be unconventional if necessary. She is passionate about her Judaism, yet is accepting of others. She has a unique combination of being a self-motivated learner who is a very capable doer as well. She taught Hebrew School for 5 years and then furthered her education by learning in Israel for a year. Buoyed by the profound experience she went back for a second year as a faculty member to lead, mentor, nurture, inspire and run programs for new students. Teaching in a Montessori preschool in Philadelphia and running educational programs furthered her commitment to Jewish Education. Settling back in her hometown of North Miami Beach, she is committed to working with Sofer On Site and using her vast experience for the growth and Holy work of Sofer On Site . Moishy Sherman born in California and raised in Israel, now resides in Miami with his wife and young son. An artist from a young age, he naturally and easily specialized in graphic design and computer art. Designing magazines in Hebrew and English made Moishy an ideal candidate for Sofer On Site as he shares his knowledge, skills and expertise with our clients around the globe. Jenny Abraham was born and raised in Michigan. She participated in NCSY as a teenager until eventually, becoming an NCSY advisor and the assistant director. Inspiring, teaching and mentoring high school students about the wonder of our heritage is her passion. Though not growing up in an observant home, yet with a Conservative Day School background and a Sephardic family, she always felt a strong connection to her religion and community. After several years of specialized teaching in day schools and Hebrew schools, Jenny realized that her true calling is Jewish programming and outreach. Joining Sofer On Site, after moving to Florida with her family, Jenny fulfills her passion cultivating their ongoing and expanding relationships with communities worldwide. Sofer on Site allows her to combine her ability to relate to Jews of all affiliations and backgrounds with her communication skills, education experience, and outreach passion to help uplift and inspire congregations throughout the country. Rabbi Menachem Bialo was born in Cleveland OH and raised with the warmth of the Midwest and unconditional love of Torah and the Jewish people. He now lives in Miami with his wife, Neomi, and 3 daughters. He studied in Yeshivot in Cleveland, Israel and Miami while training in the art of a Sofer and delving into the deeper meaning and esoteric messages of the Hebrew letters. The son of an artist, he has always marveled at the beauty and wonder of the Hebrew letters, which led him to become an expert and meticulous Sofer. He served as a youth and ritual director in Sydney, Australia as well as a teacher in the local Hebrew school. He was ordained as a Rabbi in New Jersey and then qualified as a Sofer in 2003. Since then he has been working with Sofer On Site in restoring and maintaining Torahs from all over the world. He travels and visits congregations for on-site scribing and conversing about the meanings of the Hebrew letters during Torah Projects letter writing sessions. He teaches and inspiring audiences of all ages about his passion for Torah. We are Sofer On Site - Scribes, Educators and Master Storytellers! A father, son & son-in-law team, together with our dedicated staff — we have found that being a Sofer entails great responsibility. The spiritual work of writing and caring for Torah scrolls is everlasting and therefore, we have to answer to a Higher Authority. As our name suggests, we are always local and on-site, wherever a Torah is found. We pride ourselves in traveling and visiting congregations and their Torah’s. Sofer On Site is a One Stop Shop for everything to do with Torah and much more. You will be amazed with the many opportunities we have created around Torah to engage and uplift communities. From inspiring New Torah Projects to emotional Holocaust Torah repair presentations with an abundance of insightful educational programs. With modern and advanced marketing and fundraising tools we help all those who want to bring Torah to life. Ready for a Torah Journey? email or call us to find out how we can enhance your next Torah Journey! Rabbi Gedaliah Druin was born and raised in Brooklyn, New York, where he received his B.A. from The University of Oklahoma in psychology, sociology and philosophy. He was the science curator and supervisor of education at the Brooklyn Children's Museum. He received his M.A. from The University of Oklahoma in philosophy - the spiritual and ethical development of mankind and completed his philosophy coursework and dissertation research for his Ph.D. He also taught Philosophy at the Santa Rosa College in California. In Israel, he managed a farm and later spent seven years learning in various Yeshivot and Kollels. He has been a teacher of Judaism, Israel and Ashkenazi and Sephardic traditions in diverse institutions at the elementary, high school and university level. He worked with youth movements and summer camps providing focused informal Jewish education. He returned to the USA to care for aging parents and studied and qualified as a Sofer STa"M. Today, Rabbi Druin travels the world as a master scribe restoring scrolls back to their original glory, and lecturing on the wisdom and wonders of the Torah, its making and letters. He inspires audiences of all ages with his unique and clear way of transforming ancient traditions into lively and exciting relevant lessons. Rabbi Moshe Druin is a renowned public speaker, sought after lecturer and a storytelling educator. His heartfelt, yet dynamic presentations have endeared him to Jews of all affiliations, ages and backgrounds. Rabbi Druin’s exciting and electrifying personality brings the relevance of Torah to life in a most meaningful and inspirational way. Born in New York, his family made Aliyah when he was six. He has been through the three main streams of Judaism and has studied in Yeshivot of diverse affiliations in Israel. He was ordained as a Rabbi and Scribe in New York and together with his wife Ahuva, they moved to Johannesburg, South Africa where he served as a Youth Director, Vice-Principal of the Jewish High School and later as pulpit Rabbi. He continued with his higher education in Jewish studies curriculum development at the Hebrew University in Jerusalem. Upon returning to the United States in 1998, his scribal expertise and public appearances moved to the forefront. Rabbi Druin has benefited congregations across the country and around the world in developing tailor-made educational, fundraising and community building Torah Projects. Sharing the warmth and inner wonder of Torah with a personalized and engaging approach, he is able to connect with all audiences. Today his company, Sofer On Site International, is distinguished as one of the world’s premier Torah Project developers, working with communities from Omaha to India on all facets of management, marketing, graphic artwork, fundraising and programming. Rabbi Moshe Druin lives in North Miami Beach, Florida with his wife and children.